PORTLAND, Ore. — So many bottles and cans from Washington, which has no deposit law, are being brought into Oregon with its 10-cent refund that a proposed bill fines those who practice the redemption runaround. Senate Bill 522 defines potential violators trying to redeem the dime per container as "the person who knows or has good reason to know were not sold in this state." Sponsored by Scappoose Democrat Sen. Betsy Johnson, once a person brings in 25 containers from out of state, it triggers a potential fine of $250 under the bill. At a public hearing March 14, opponents of the bill said it was cruel to the homeless and poor who rely on the income, however modest, from redeeming bottles and cans regardless of their geographical origin. Johnson told KGW that retail grocers in her district every day are overwhelmed with massive bottle returns from the Washington side of river, sometimes by the pickup load. It's to the point where it's a public health hazard for grocers, whose employees are challenged and threatened by some of those trying to redeem bottles, she said. Her bill is based on a similar law in Michigan, she said. As it goes through the work session and committee system, the number of containers and the fine may change. What's important, she said, is that it gives the police and the redemption system another tool to deal with the issue. Michigan's laws are harsh. Violators can face a $5,000 fine or 5 years in prison for returning containers. The state was famously highlighted in a "Seinfeld" episode where Kramer and Newman scheme to drive a mail truck full of containers to Michigan. It's one of a number of steps that have yet to be put in place to create the idyll of seamless recycling, she said. 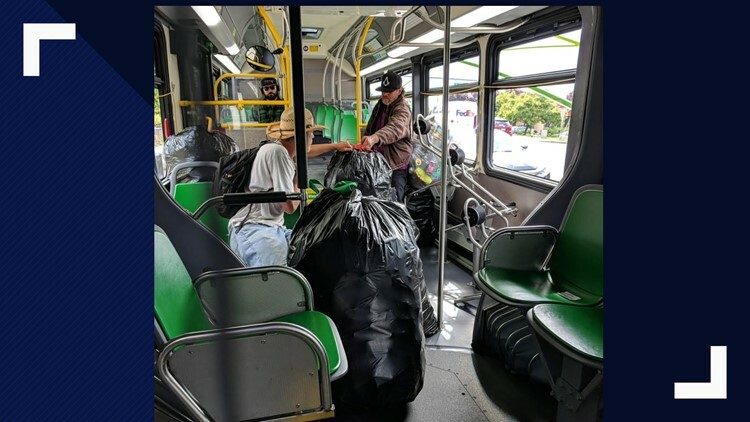 Last September, Clark County's C-Tran banned passengers from bringing cans and bottle onto buses "due to continued sanitation and safety concerns." The agency has a route that crosses the Interstate Bridge with a stop at Delta Park/Vanport MAX station. Due to sanitation and safety concerns, C-Tran banned bags of bottles and cans from its transit system. On a recent visit to the BottleDrop Oregon Redemption Center at North Hayden Meadows Delta Park, a number of cars had Washington license plates. The same can be said for any grocery store near the border, Astoria to Ontario, says Joel Schoening, spokesman for the nonprofit Oregon Beverage Recycling Cooperative, which runs BottleDrop centers statewide. "You're basically taking a deposit that was never paid," he said. The spike in out-of-state donations started when the bottle deposit in Oregon was raised from a nickel to a dime, Schoening said. People are taking bottles and cans out of containers curbside in Washington border towns, he said, so the process begins with theft of a homeowner's property. BottleDrop security guards "engage with hundreds of people a week," he said. There are some instances where Washington residents grocery shop in Oregon and return to deposit centers with proof of purchase receipts, he said. Not all were in favor of the bill. "Returning bottles is an important source of income for many people living in poverty," Kimberly McCullough said in testimony before the committee. "Fining people for acts of survival, people who are trying to scrape by enough money to survive, is deeply problematic and likely to exacerbate issues of poverty in our communities."